Antiques challenge. 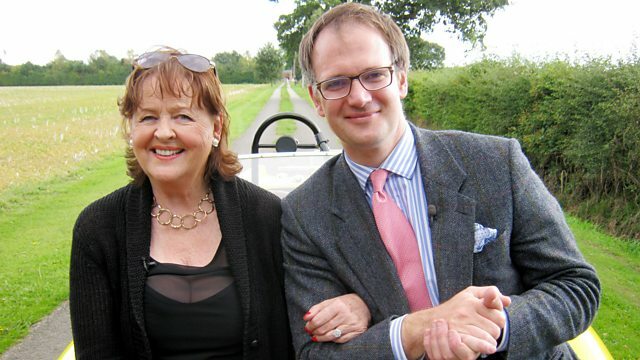 It is day two for Charles Hanson and Margie Cooper as they start in Newark-on-Trent, Nottinghamshire, and head for auction in Bolton, Lancashire. -That's the way to do this. But it is no mean feat. Welcome to day two with Margie Cooper and Charles Hansen. the only one of its kind on British roads. -We haven't changed gears for the last five minutes. -Are you in top gear? -Top gear. You are not back-seat driving, are you? making a profit. But Charles was the big winner. This is a new day, Margie. The sun's shortly without his hat on. experts each started with £200, she has some catching up to do. She currently has £266.56 to spend. Charles, meanwhile, is in the lead with £396.70. I look at you, and you just are glamorous. You know, just go Hollywood on me. Just spend it, Margie. You know, it's only money. These two are on one epic road trip. their week near where they started, in Leicester. and ends with an auction in Lancashire's Bolton. The first stop for both our experts is Newark-on-Trent. Civil War, withstanding three sieges by Cromwell's Parliamentarian rebels. The first shop of this trip is a shared experience, so stand by. Margie, remember, think of England. Just trying to find something that's...a bit quirky, really. That is a sweet little chair, that, isn't it? Look at that little baby. you'd have the much bigger chairs like that. But this is a typical design of the mid-Victorian era. I think it's in walnut. This Victorian nursing chair is priced at £115. Wow. That is such a nice little chair. It's perfect. Oh, Charles is humming. Is that a good sign? It has clearly been buried for some time. because of what that bottle would have been part of. Priced at ten pounds, is it worth a closer look? Margie has tracked down dealer Jill. That furniture up there, is that your...? -Right at the far end? -Right at the far end. I've just seen this sweet little chair up there. It has got 115 on it. It needs to really topple down. -Let's have a start... Let's have a starting point. Well, I was thinking when I saw it - 68.
of this leg of the trip. -Thank you very much. Pop back and see us again. exhumed, apparently, from the Somme. Dealer Wendy is on hand. We've even got a bullet hole here. having been in the ground. And to have unearthed this with this story takes my breath away. But what is its provenance? if its origin can be verified. ..Margie has found a hidden corner of the shop...and Roger. -See, you're tucked away, I nearly missed you. -All you have to do is say what you are looking for. Well, I was looking for silver bits of jewellery. -I'm not looking for badges. -We have got some little bits over there. -There is a lovely little brooch there. Very Deco-looking, although it is quite modern. But it is such a small mark, I need a really powerful magnifier. I always carry this with me. Good luck with it. The mark is on the edge. -And I'm going to shake your hand at £30. A nice nine carat gold brooch at £30? Two items in the first shop for Margie. Charles is still to get off the mark. How about that water bottle, Carlos? brings us into a certain time check. but you can with that bottle. I'll shake Wendy's hand now. Ten pounds. -We will enjoy what it represents. Thanks awfully, sir. and was sold to him for a sum of money. when he used to teach our youngsters all about the Great War. It's amazing it survived THAT! Absolutely. And that is real history, isn't it? It can't be proven, but at least it gives SOME provenance. I take £20 out. There, give that to you. -Thank you. All the best to you. Thanks, Wendy. Bye-bye. of light that shone during one of the darkest periods in history. The guide for the afternoon is centre Chief Executive Phil Lyons. Welcome to Beth Shalom, house of peace. by the children's transport known as Kindertransport in German. So, tell me the story of Kindertransport. Well, the story has a very, very complex background to it. It starts in the mid-'30s in Germany when Hitler came to power. the Jews from the German population. In the mid-'30s, anti-Semitism was on the rise in Europe. Jews were persecuted and their businesses destroyed. homes were trashed, were ruined. 30,000 German Jewish men were arrested, sent to the camps. And in a sense, the State had engineered all of this. it was virtually impossible for them to leave. The international community started to take notice. through emergency legislation within a fortnight. and religious groups to save persecuted children. just like this reconstruction at the museum. and girls were welcomed into the arms of foster families. When they arrived in the UK, what faced them? -and support offered to them. what you'd want for children. I'd want that. Through all the travesty, they did survive. -That is the most important thing. And most of them went on to lead positive family lives of their own. just 15 when his German Jewish parents feared for his safety. with schoolchildren who visit the centre. And that was the last time I ever saw anyone from my family again. nobody had told me anything. I didn't know where it was going. ..and, eventually, you'd meet up again and live like a family again. After the war, Bernard settled in northern England and married in 1947.
he found an appointment as a farm labourer. Do you think Kindertransport saved your life? very few that ever saw their parents again, or any relatives again. ..as it did mine. And I will never forget that. able to start new lives and, like Bernard, contribute to our society. -Around 50 dealers trade from here. Simon, what a lovely antiques centre you've got here. would you direct me anywhere in particular? I'd direct you into the backroom, yeah. -Right, OK. It is safe back there, isn't it? -Hope so. OK. See you shortly. Charles has just under £380 left to spend. Says it's nine pounds. It's new. But boys and toys... It's quite nice. SCRATCHING Oh! Mind the table, Charles. One thing I love about history is the sampler. And here you've got a wonderful sampler. And we marvel at samplers because they were a girl's education. Take a bow, Sarah McCune. probably date this sampler to around 1770. Simon, this sampler here, I can't see a price. You want to do £40? I'll meet you in the middle, 45. Despite the few holes, this is a nice item for £45. Anything else in here, Charles? What will sell well in Bolton? What will sell well in Bolton? Well, how about a pair of clogs? May I try one on? Do you mind? Knock yourself out there, Charles. Wow. These are early-19th-century clogs. And stepping back in time is fascinating. off in the 1840s, in the 1850s, in industrial England, in the North. Do they suit me or not? Not really, do they? But the reason I like these is because they are so crude. They almost look like a horse's horseshoe. What a find! I'm going to find Simon. The clogs are priced at £35. -Do you have clogs at home? -Does your wife wear clogs? -What is the best price? -Sold. I'll take them. Thanks, Simon. Thanks a lot. Two in the old bag, eh, Charles? But is there still more? What we've got is a bronze Buddha, possibly 19th century. I just quite like it. It's got this dirty appeal of just being well-worn. Simon is asking £35 for this little Buddha. Simon, I quite like this. -I'll do it for 25.
and a bronze Buddha, all for a total of £90. -Thanks, Simon, all the best to you. And with that, today's shopping comes to a close. The next morning, it is a bit of a damp start. -I'm going under. So I'll say goodbye to you. and a pair of 19th-century clogs. but bought just two items - a gold brooch and a Victorian nursing chair. This morning, they are heading for Mansfield, in Nottinghamshire. This is, I think, a fairly untapped part of North Derbyshire. It is quite barren, yet it's fertile. -Are you feeling fertile today? -Well, if we get in the right shops, I shall feel fertile. Mansfield was once a lodging place for medieval royalty. It is Margie's first shop today. Oh, my gosh, what a day. That won't fit through the door, love. -Nice to meet you too. What a horrible day. Perhaps you'll find something to brighten up your day, Margie. So are all these old toys here? Oh, God, he's cute, isn't he? -They are called Mobo, aren't they? -And they had much bigger ones. And rocking horses. This is a little tiny one. He's dead sweet. He's not in bad nick, is he? -Considering his age, he is quite good. -Yeah. What is he, '50s? -Yeah. Well, he's a thought. Well, that is one strong contender. Uh... So what have you got in here? Let's look. everything from fever to madness in both people and animals. Yeah, I quite like things like that. -It is a bit unusual. My, I'm glad I didn't live then. Can you imagine? Yeah! It is priced at £45. Cutting-edge, eh? Is that the very best on that? -I'll do it for 30, and that is my best. I feel as though it is a bit rude to say 28.
and Margie has got something a little different. See you! Oh, what awful weather! Mary Poppins never had this trouble. Oh, well, let's do it. and Sherwood Forest, near the village of Creswell. Hannah Boddy is Creswell's exhibition manager. This is Creswell Crags Gorge. It is absolutely gorgeous, despite the weather today. Tell me about this site, this backdrop behind me. Well, it is amazing because we have evidence from the Ice Age. could get to in the whole world during the Ice Age. of Creswell and the UK was joined to the rest of Europe. -This is inviting. And very exciting. Britain's oldest artwork, in this cave. -Oldest and only rock art. -Yeah. Oldest, only Ice Age rock art. I'm looking hard, and I can't see any. This cave kept a secret for over 12,000 years. why they remained undiscovered until 2003. Ice Age man walked this far north but that he brought his art with him too. Hannah, I can't see anything yet. So, here we have a deer stag on the wall. -They've used a natural feature for the mouth. -Oh, I can see it. -And then just... I can see two ears as well. Oh, it's wonderful. I can't believe it. 23 drawings were discovered in this one cave. in Derbyshire one of international importance. and France feature animals drawn in a similar style. But, Hannah, how can we date this cave art? see this area here of flowstone, which is growing on top of it. Flowstone is similar to stalactite and stalagmite formations. years old, proving the deer and other pictures were drawn by Ice Age man. archaeologically and geological sites in Britain. 12,000 years ago were real explorers. They were going as far north as was humanly possible. They were clever people. They were hardy people. Now, which way is out? More importantly, which way is the bison? I am on the hunt. See you later. Don't forget to give back the helmet, Charles. border, into Derbyshire and the market town of Belper. Her next shop is a big'un, set in a former Victorian mill. Colin is in charge today. -Hello there. How are you? You can have a wander around. Also, while I'm doing that, yesterday I bought a little brooch. -You haven't got a little box, have you? -I might find one, see. -We might find one for you. Well, we will find you one then. Margie has £138.56 to spend. This is her last opportunity to buy before the auction. That's nice, isn't it? Lovely old gate, look. I love that. Don't you? Magnifico. Architectural antiques, they are good. Margie has fallen for this Victorian iron gate, priced at £90. It is not the prettiest thing we've got, is it? -Are you surprised I selected that? -I am a little, yeah. -Good, it'll be cheap then. -Well, where has it got to be? -Well, I would be happy buying that for 40. -Add a fiver to it so I can have me tea and it is yours. -I think we'll go for that. 45? That's half-price. Well done, Margie. Does anything else take your fancy? Well, it's quite a big pony. when he's pulling on a lawnmower. Back in the day. Before motorised motors pony-drawn cutters were used. These booties prevented a neat lawn from being cut up by the hooves. This one boot is priced at £55. I just like the memory of this. You know, of the horse with these little boots on. I really like it, though. -What have we found? Something really daft. -I'm just looking at this, which I find really interesting. -And you know what it is? -I do know what it is. -It is an interesting piece. -You could make something of it. -What do you think a nice bottle of wine would cost you? Oh, Colin. How about if we split that? And then we can be friends. -That's marvellous. That's very kind of you, Colin. -"Have you got a little box for me?" -Yeah, have you got one? What about 50p? Thank you. That feels like a win. Brilliant. A wise 50p spent. in the former mining town of Bolsover. She's quite nice. I quite like this lady in here. This 1930s figurine is made of an alloy of zinc, also known as spelter. She is quite nice. I'm quite surprised. £18. To me, she is striking. She is Art Deco. She is glamorous. She is almost as glamorous as Margie Cooper. For that purpose, I need to go find the key for cabinet number six. I wonder why. Perhaps Carol knows. Oh, she is gorgeous, Carol. -Hello! Margie Cooper-esque. Isn't she lovely? -Just got one problem. You've got them, she hasn't. -Where have her thumbs gone, Carol? -Has she been nibbling her nails and gone too far? She is missing her thumbs. hence why the dealer has put on here AF. But turning it round, look at that lovely back. hasn't been dropped or dented. It is in particularly nice condition. Carol, she is missing her thumbs, but she can still dance. -Do you want me to go and check? -# On me... # Try a tenner. Ten pounds? He is trying his luck. -The best we can do is 15. For that sort of price, I'd be rude not to. She is gorgeous. She is stunning. She may be thumbless, but at that price, she is worth taking a punt on. And Charles isn't finished here just yet. I'm quite taken by this cabinet here. It has got quite a few reproduction wrist watches in. But more importantly, it has almost got a lot of sentiment in. Charles' eye has been drawn to the militaria. June 6, 1944, D-Day landing. when, sadly, so many individuals lost their lives. who knows, brought back by a soldier. for something which has such emotive value to such a day. I'd love to learn more about this. Best call the owner, then. Fortunately, Carol has his number at hand. Go, Carol. Can I just pass you over? Hi, mate. Just a really interesting cabinet of curios. And obviously, it's a piece of cement and a bit of barbed wire. "Goodness me, Hansen, you're not really buying antiques." such history and to one such day in particular. The owner claims it came from a specialist dealer. Provenance here is hard to prove, but Charles is taking a risk. What is your best price? On at ten pounds. I'd be a fool to say no. I'm going to say I'll buy it and thanks ever so much. Thanks, mate! And that concludes the shopping. -15 and five is 20. Thank you so much. Thanks, Carol. Thanks again for the memories. They've been busy on this trip. the First World War German water bottle to make a militaria lot. and an Art Deco figurine. All that lot cost him £120. and one leather pony boot. So, what do they make of each other's buys? I love that Art Deco brooch. And heaven forbid, for £30.50, you have bought real gold. -the saleroom is in Lancashire. And that is taking coals to Newcastle. There are lots and lots of clogs in Lancashire. I am quite happy to go to Lancashire with my bootie to take on hers. And hopefully, I'll be victorious. they head for an auction in Bolton, Lancashire. Bolton was a 19th-century boom town. making it one of the most productive cotton spinning towns in the world. where there's muck, there's grass. And where they see our mucky buys, there's grassy treasures. I think muck and grass is Yorkshire, but never mind. housed in the former Metropolitan Library building. -I shouldn't have worn a skirt. -It's all to come, Margie. That's the way, Margie, a Lancashire lass does it. -I was that before you. -And I'm a Derbyshire man. Presiding over proceedings is auctioneer Stephen Sloan. What does he make of our experts' buys? a jolly good collector's item. And I think he should do quite well today. A pony boot, yes, obviously one of four. Now, I must say, this one is in exceptional condition. Now, what you would do with it, I have no idea. his colleague Mia is primed to receive online bids. Time for our experts to take their seats. -Very well. How are you? -This is Bolton, isn't it? -Are you trembling in Bolton? It's Charles's pair of clogs first. -I have never seen such a big pair of clogs. -You know, you brought clogs to Lancashire. There are a heck of a lot of them around. Thank you, sir. 30, bid. 30. -Come on, they are wonderful boots. -At £42, this is for two. And so you should be. You've walked away with a £22 profit. Next up, Margie's 19th-century fleam. Gosh, I feel quite squirmish now. I'm even more nervous for you. -Come on, crawl a bit more. -38. 40? £40. And two? 42. -it is giving me heart failure. That is Charles and Margie both making a profit on their first lots. A great start. Now, time for Charles' sampler. -Anybody got £40 for it? £40? 30 bid. 30. Five anywhere? At £30. -Quite right, I like her style. -All done at £60? It is here to be sold. That's great, I'm very happy. It could've gone the other way. But it didn't, and you're faring well. Margie's gate is next to go under the gavel. Gracious me, scrap metal now. 20 bid, thank you. 20. Two. 30. 30, and two? Two, thank you. I am selling at £42. This is no money at all. The auctioneer thought this next lot could do well for Charles. It could be full of Eastern promise. We are live online. -Say what, £100 to start me? -70 bid! Come on, let's go! -It is a very rare opportunity. -Very good. Thank you very much. Thanks, partner. A brilliant profit on that little chap. Well done, Charles. First clogs and now Margie's pony boot. But will our second footwear lot be as successful? Say what, kick it in at £20? 20 in the room. £20, thank you. And two. -36, new money. 38? Try two. Back to the net then at 38. 38. 40 anywhere else? -Well done, partner. They're all in the room. Next up, Charles' thumbless figurine. -Are you sure she's not repro? -Where would you like to be with her? -£30 to start me. Thank you. In the room at £30. 30. And two. Thank you very much, sir. Thank you. 46 in the room. All done at 46? She had no thumbs but she was a lovely lady. I am really pleased. Margie's brooch is next. And in a new box. The auction house have kindly found a smarter box than the one she bought. Could have saved yourself 50p, Margie. Where would you like to be with this one? Say what, £40 for it? -Two anywhere? On the bloke at 42. Wow, Margie Cooper, take a bow! -In two places. 74, sir? In the room at 74. 76? At 74 in the room. Gentleman's bid in the room. -Marge, they've all been waiting for this. Margie has bagged another great profit. And she's up again with her Victorian nursing chair. Where would you like to be with that one for me? 65, thanks. There we go. -That's what I should've paid. -£70. 70 here. And five. I just love buying things and selling them at the same price. It's wiped its face, Margie. Our pair's last lot now. It is Charles' wartime memorabilia. They were both risky buys as the provenance is questionable. Thank you, sir. 20, and we're away. 20, and two. I have 20. Two. 22. 24? 24. 26. 28? It is all about the history, Margie, forget the money. -It is just to see a bit of history. -34. And six? Six, thank you. -Ah! You are getting there. -It is real history, Margie. You can't buy history, but you can today. And ending on another profit for Charles. Well done, both of you. Time to tally up who's today's winner. Margie started this leg with £266.56. she has made a profit of £13.76. This means she carries forward £280.32. Charles, meanwhile, started with £396.70. to spend on the next leg. I feel like a pirate. ..and Margie reaches new heights. I feel like I am going to break it. You're going to lose the sale! It's day two for Charles Hanson and Margie Cooper as they start in Newark-on-Trent, Nottinghamshire, and head for auction in Bolton, Lancashire.